Chione T - Specifications of a Tradewind 25, a modern gaff cutter. Introduction This page provides a full specifications of "Chione T" - a Tradewind 25 (Atoll). The Tradewinds are semi-custom designs i.e. many of the constructional details can be tailored to your needs. Clearly the basics e.g. hull and deck construction and vital statistics, are standard. The interior layout, equipment, and detailed deck hardware can be customized to your requirements. This is a rather long page. Please feel free to browse through it or use the links below to jump to sections of more particular interest. The hull and deck were moulded by Blondecell Marine of Lymington, to the following specification. All isophthalic polyester resins, with first laminate powder-bound. Topsides = 2850 g/m2 +5mm coremat. Deck = 3000 g/m2 + 12mm end grain balsa core (12mm ply at deck fittings). The two tons of lead balast, primarily in the form of ingots, is set in resin and bonded over with 2400 gm/m2 grp. Epoxy coating (osmosis protection) - International Gelshield 200 (5 coats). Anti-fouling - International MPX, white (1 coat) then Micron CSC Extra, red (2 coats). Although essentially of GRP construction, Chione gains much of her classic good looks through the extensive use of teak, both on the exterior and interior, and her traditional wooden spars. Substantial coamings add to the feeling of security in the deep cockpit. Teak trims are used to edge the top of the coachroof and hatch garage. These are currently finished with Epifanes' "Woodfinish" Gloss varnish (which is wearing far better than the Deks Olje treatment that we initially applied). A specially made teak instrument pod on the hatch garage (known affectionately as "Marilyn") and the double washboards are also finished this way. In addition, Chione has teak toe rails, rubbing strake, grab rails, and payed and laid cockpit seats; all of which we have chosen to leave untreated. The mast, bowsprit, boom and gaff are all of Canadian sitka spruce and manufactured by F.J. Collar of Oxford. They are currently finished in Deks Olje #1 and 2; all fittings are of stainless steel. Forestay, cap shrouds, lowers and running backstays are all in 6mm (1x19) stainless steel wire with swaged ends. The bowsprit shrouds and bobstay are similarly constructed, though the latter has a 3:1 tackle rove with hemp coloured polyester rope. All halyards are in 10mm braid line, the sheets are 12mm. The cream mainsail has a 2:1 purchase on the throat halyard and 3:1 on the peak. The two slab reefing lines are rove through cheek blocks on the boom and thence through clutches just aft of the gooseneck. Mainsail reefing has been designed to be accomplished by one person standing at the mast - a harness attachment loop is incorporated into the tabernacle base. To further ease handling, the main is fitted with lazyjacks which integrate with the twin topping lifts. Both jib and staysail (also in cream) are on Schaeffer roller gear: the jib uses a 550 furler, whilst the staysail is set on a 750 roller reefing system. Their reefing lines are rove through stanchion lead blocks to clutches on the quarter side decks. A novel arrangement for the jib and staysail sheets makes tacking both together particularly easy. The sheets are rove through clutches on the side decks at the forward end of the cockpit and thence to their winches. Chione is equipped with a number of custom-built 316 stainless fabrications, principally the tabernacle, bitts, winch stands, gaff saddle, pushpit and stanchions. Some of these may be viewed in the Picture Gallery. A pair of Lewmar self-tailing 16:1 winches is used to handle both jib and staysail. In a MOB situation they have been designed to provide the necessary 'oomph' for casualty retrieval, linked to a 3:1 tackle which we have made up specially for this task. All blocks are from the Lewmar Ocean range: size 1. The only exceptions are the two blocks used on the bobstay tackle. We chose Schaeffer blocks with stainless steel casings for this job - to blend with the other stainless fittings on the bowsprit. Rope clutches are used to control reefing lines and, more unusually, headsail sheets. They come from the Lewmar (again!) D1 range. No prizes for guessing that the hatches are also by Lewmar . An Ocean 60 provides a large emergency exit from the forepeak (as well as making for a more airy cabin) whilst smaller hatches from the Ocean range are used in the saloon and heads. 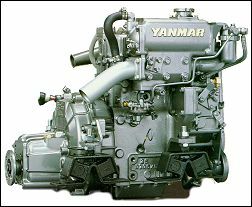 A freshwater cooled, two cylinder, 18hp (16Kw) diesel is installed below the companionway steps. It drives a fixed 3-blade bronze propeller through an 'Aquadrive' flexible coupling. The Aquadrive, from Halyard (M&I) Limited makes for smooth power transmission and relatively quiet motoring (when we really have to!) The traditional stern gland is replaced by a PSS packless shaft seal - no greasing required! The PSS Shaft Seal is a mechanical seal that uses a self-aligning carbon-graphite stator to ensure a 100% watertight seal with proven reliability. The Tradewind 25 has four berths: a double in the forepeak and two settee berths in the saloon (the port side one making use of a trotter box). Starting at the companionway, the galley is to port and the chart table and instrument / electrical panel to starboard. The chart table also doubles as the refrigerated cold box, but then some compromise is inevitable in a 25' hull; this one works pretty well. Four bronze portlights are set into the cabintop. The two settees and saloon table provide comfortable seating for four or five people. Ahead of the saloon is the heads, to startboard, and an attractive etched (safety) glass fronted locker to port. Finally we have the forepeak, with it's double berth, hanging locker, and reading lights. There is a plethora of storage locations, not an inch of space is wasted - a total of 34 covered locations: lockers and bins, as well as the deep dry bilges (the forward bilge makes a particularly fine wine cellar). This still leaves room for sizeable open book storage on each side of the hull. The ambience of a country cottage is deliberate - you may choose otherwise! The panelling is a mixture of varnished teak veneered ply and grained T&G effect GRP panels. This gives an 'easy care' version of a traditional look yet maintains a very light and spacious feel. The teak deck beams (non-structural) and full length grab rails very much add to this ambience. Although the whole boat is well served by brass bezelled electric lights, we often prefer to light the gimballed oil lamp in the saloon to complete the cosy feel. By the way, a non-traditional Diesel heater in the cockpit locker feeds warm dry air to the saloon and heads (ideal for drying out wet oilies quickly). Just a special mention for two small but very important areas of the accommodation. The galley is well equipped with ample storage, a gas cooker with a properly controllable oven (up to gas mark 9) and a silent refigeration unit in the cold box - see the Equipment page for further details. A lever action brass pump provides the traditional touch here (cold water only I'm afraid).